Yokoso! 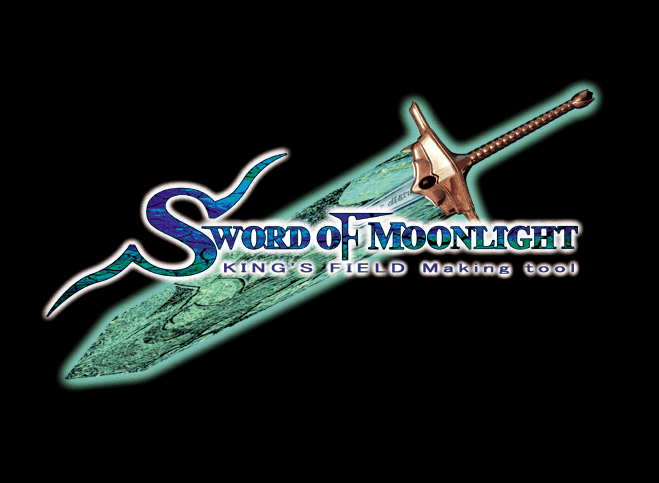 Readers, like KING’S FIELD, Sword of Moonlight comes to us from the land of the rising sun, in Japanese. The pictures and descriptions here are in English. Some pages may be available in other languages. There is a language bar at the top of every page. This section, with subsections, tours Sword of Moonlight. You can follow step by step with your own install or just come along for the ride. There are more sections listed in the sidebar on every page from here on out. Subsections, if any, are listed first in big print. 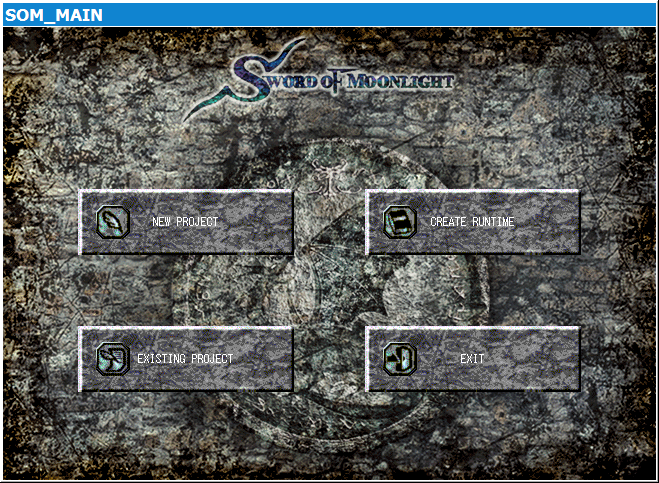 Be sure to checkout the Sword of Moonlight Ex section when you are ready to set things up for yourself. And if backstory is your thing, there is an About section for that. When you’re ready, hop in, buckle up, and get ready… all aboard the KING’S FIELD Making Tour Express! Kerplunk! Behold the Sword of Moonlight. No sound effects. Just this screen for a few seconds. If you have the box set or KF2 soundtrack or have seen the KF remake FMVs you might recognize this version of the Moonlight. *These screenshots utilize fairly ancient translations. Most of the pages on this website are fairly ancient for that matter, sorely in lack of higher quality material. SOM_MAIN, aka the main menu presents us with four possibilities. NEW PROJECT, create a skeleton of a project somewhere on your network file system and proceed to edit the project. EXISTING PROJECT, continue editing a project somewhere on your network file system. Provided you can remember where you put it. CREATE RUNTIME, the last step of any project. Convert it into a stand-alone redistributable game. You may do this multiple times throughout the course of a project, producing tests, demos, refinements, updates, et cetera. EXIT, don’t leave yet. The fun has just begun! There’s only one way out of Sword of Moonlight provided by its original developers, and this is it. Not much else to do here other than to take in the fine craftsmanship of the antiqued dragon relief finish and neat little icons dreamed up by Sword of Moonlight’s creators. It’s worth mentioning that SOM_MAIN is the only one of the tools you can fire up by clicking on it in the likes of Windows Explorer. The other executable files require secret commandline arguments be passed to them or else they refuse to do anything. Published on Monday, July 4th, 2011. Reader responses and followups can be followed via the following RSS 2.0 feed. Leave a response, or trackback from an other site.